Telco alarms are alerts for problems indicated by telco equipment. They are typically weighted by importance as critical, major, or minor "severity" levels. These problems are normally related to failures in the chassis - high temperatures, fans breaking down, and other hardware issues. What is a Telco Alarm? Telco alarms are most likely monitored by discrete contacts, small contact closures that issue a burst of voltage when an alarm condition is present. Discrete alarms only provide binary reporting functionality. Remember that your telco gear will generally have discrete outputs that each designate alarm severities. This provides another dimension when planning your alarm response. These discrete contacts are monitored by a remote telemetry unit (RTU), a device that sits inline with your telco gear and reports alarms as they occur. The RTU serves as your eyes, ears, and, occasionally, hands at your remote sites, keeping you up to date on problems throughout your network. Sophisticated RTUs, like the NetGuardian 864A, can monitor up to 64 discrete telco alarms per unit. Expansions are available to increase capacity. By expanding, you can monitor even your largest remote sites. The RTU should be able to send notification for alarms. Some RTUs will report to a log file, requiring the user or a third party program to weed through terminal entries to determine when there's a problem. Better RTUs will send alerts for alarms. The NetGuardian series from DPS Telecom can send notification for alarms via email, phone, or text. When a telco alarm "set" occurs, your techs can monitor directly from a smartphone or laptop. They won't have to wait for dispatch from the Network Operations Center (NOC). NetGuardian RTUs also offer an easy-to-use web interface. Your technicians can access detailed alarm information from their laptop, smartphone, or any other device with a browser. They must simply have access to the RTU via the internet or your intranet. Additional Monitoring/Control Options Supplement Telco Alarm Monitoring. To supplement telco alarms, some RTUs offer analog inputs and control relays. Analog inputs allow technicians to measure conditions that might affect the gear without directly monitoring the equipment. Analog sensors typically report four alarm thresholds, major and minor, over and under, and are used to monitor conditions such as temperature. Let's say, for example, you were to set a "minor over" threshold at just above the set point for your site HVAC. Then you receive that "minor over" alarm. That would mean that your HVAC equipment is malfunctioning. While this doesn't indicate an alarm from your equipment directly, it does indicate a condition that could potentially affect your telco equipment. Control relays are simple circuits wired to your telco equipment to perform functions remotely. Control relays perform on-off functionality and help you avoid making a trip to your site to perform minor maintenance duties. You can even derive control relays to operate based on your telco alarms and analog threshold alarms. When an alarm condition occurs, your RTU can handle the problem without bothering you. Consider one of your telco sites. Let's say, for example, you had an analog sensor monitoring fuel for a main generator. You could derive a control for it. When the analog sensor set an alarm for low fuel in the primary generator, it would power on the secondary generator automatically. This would keep your telco site powered and operational without requiring any manual action. You would receive an alert. The NetGuardian's control relays can be operated from the unit's web interface or from a master station. 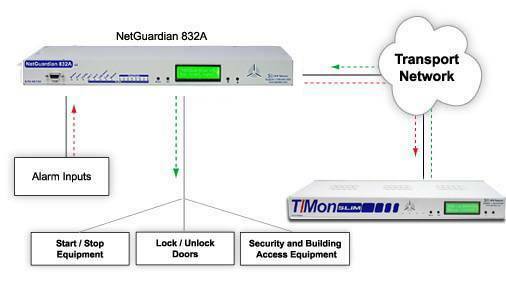 The T/Mon SLIM in the diagram above has access to the NetGuardian. Getting All of Your Telco Alarms on One Screen. Telco networks are most likely large and incorporate a number of sites. You'll be monitoring those sites with your RTUs. That's why you'll likely want a master station. It will incorporate all of your telco alarm and other monitoring information in to a single interface. The master station will save you the trouble of having to associate a point reference with a site whenever you receive an alarm. The master should do it all for you. This provides a very complete view of your network. This is better than you could possibly have by monitoring your RTUs individually. A strong master station, like T/Mon, will bring in your telco alarms from sources under any available protocols. Whether you're working with equipment in legacy or proprietary protocols, T/Mon will capture all of your telco alarms, so you can keep all of your alarms on one screen. 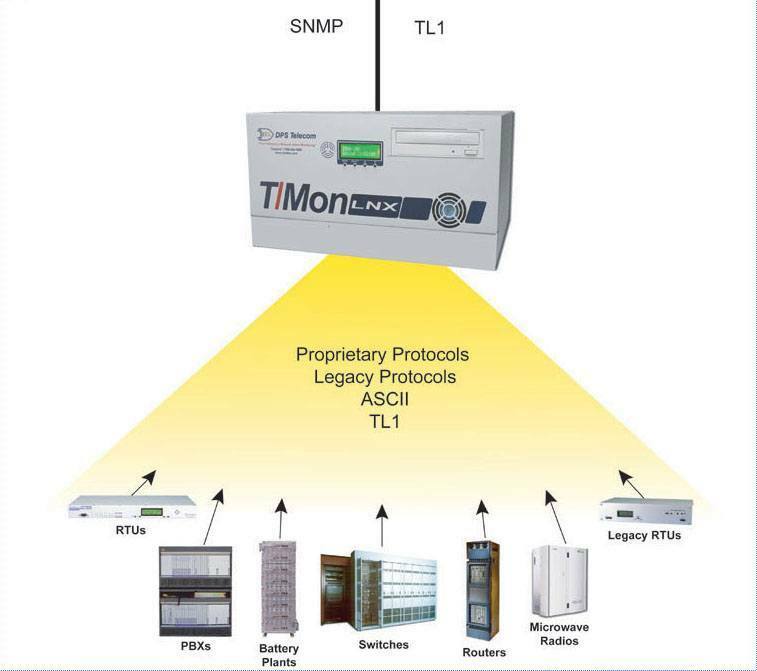 T/Mon can receive alarms from any protocol in use in your network, legacy, proprietary, or otherwise. Outside of that, your telco alarm master should provide alerts for alarms, and an easy-to-use interface to simplify alarm management. T/Mon can send notifications for any of the alarms you collect via email, text, pager, or with the SiteDialer accessory, voice. You can even setup progressive alerts, so if the primary technician for a particular site or alarm fails to acknowledge an alarm, T/Mon will alert the next person down the line, and so on. As technicians acknowledge alarms, the NOC will know where the technician is headed and can help ensure that technicians don't overlap in attempting to deal with alarms. These sorts of alerts help you ensure that your telco network is maintained and repaired quickly and efficiently, whenever a problem occurs. Your telco alarm master should also employ an easy-to-use interface. This makes monitoring alarms simple enough for anyone in the NOC to understand. Many master stations provide a simple terminal interface. These interfaces are powerful, and quick to navigate, but most likely require intricate knowledge of your telco network and a great deal of training. Novice users won't be able to help you effectively manage your network. Better master stations employ a graphical interface, something that displays alarms in an intuitive way, both reducing errors and allowing more users to monitor the network. T/Mon does this with the T/GFX interface. T/GFX displays your telco alarms on a map, so when an alarm sets, you can see exactly where the problem is. The map-based interface also allows users to "drill-down" from higher levels of the map. They can move from your network at large all the way down to the floor plan view at your sites. There's no mistaking the location of an alarm. On one screen, T/GFX consolidates trouble tickets, text messages, and a list of standing alarms. A technician accessing the program can instantly see all available information associated with any of your telco alarms. Telco alarms don't have to be hard to manage. With the right RTUs and the right telco alarm master, you can keep track of network failures when and where they occur. This increases maintenance efficiency and reduces the likelihood or duration of network downtime.